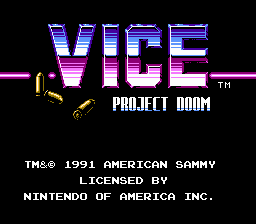 Vice: Project Doom is a platform game with driving and shooting gallery style stages as well. There are cinematic cut-scenes between levels, with a secret agent storyline. 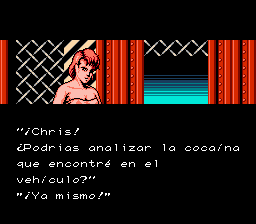 It plays much like Ninja Gaiden mixed with Batman: The Video Game. 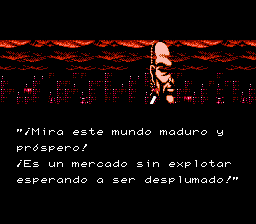 The game has beautiful level designs with great use of color and contrast, and lots of scrolling tricks, including a parallax scrolling train level much like the one in Ninja Gaiden II. 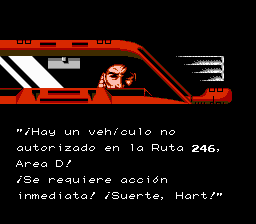 Full translation to Spanish (except the game bottom bar) for “Gun-Dec”, for the Nintendo Entertainment System. Adds special characters. Patch in BPS, use floating ips to apply it. 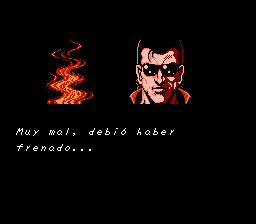 Based on the version by Stardust Crusaders.